Part one: an institutional shell game. One of the absurdities of the contemporary university is this: at the same time that those of us firmly held in the tight embrace of tenured institutional belong begin to really acknowledge that most of our PhD students are not going to become professors, we same tightly embraced tenured people are being actively pushed (“incentivized,” I think, is the jargon for this) to increase the numbers of graduate students we enrol. The math here is complicated. Which is to say, I don’t quite understand it, but it tends to the effect that graduate students in all areas are profit-making for the institution. There’s a net gain to the university for each grad we enrol, and a bigger cumulative gain if we enrol a certain biggish ‘target’ number. I begin to suspect that like the users of Facebook and like the audience of broadcast television, graduate students are the product of the institution rather than its consumers (forget apprentices). Facebook and TV sell their users for advertising revenue. And the university? From what I can tell, over and above the reputation points we gain for having PhD students around generally, and beyond whatever measure of glamour or power that accrues to individual supervisors for having acolytes, the university ‘sells’ graduate enrolments to the provincial government for incentive money. I think. Like I say, the math is complicated. I am developing some ethical concerns here. Part two: when do you break their hearts? Many of us tell many others of us to stop admitting graduate students to our programs: there are already too many graduates without jobs! (By ‘jobs,’ we only ever really seem to mean ‘tenure-track professorships’.) The debt loads are crushing! You’ll be 40 and unemployed, living in a basement, teaching remedial composition to part time phys ed majors for approximately 40 cents an hour. Students, though, still clamour to come. They have big ideas (like I had) and dreams of the life of the mind (like I had). We’ve already discussed here (and others have discussed elsewhere) what to do about this disjuncture. So you want to get a PhD in the humanities? Ha! But then, every one who sits in a chair in an office with SSHRC reference forms in hand and grad applications piling up can’t say that it’s impossible: we did it, right? I actually get to live my life of the mind with my big ideas and it’s pretty sweet. But no tenure for you! Many of them–many of you–want to keep coming, regardless of the dire warnings. Many of us–me!–are uncomfortable either squashing the grad school dream or nurturing it. I mean, I love the big ideas the graduate students bring to the seminar table, the office hours, the committee meetings. But I don’t want to see anyone disenchanted, disillusioned, broke and in despair after they graduate. Or, God help us, dragging their degree out for a decade to hold on to the pittance of one teaching assignment per term, gripping the life of the mind by the fingernails. What to do? I have yet more ethical concerns telling potential grad students not to follow their dreams and their interests. If you want to do a PhD, you should do one. But! Only under this condition: you treat it like the first job of your career. Think of the PhD like a 4-6 year chunk of time, a discrete part of your life, where you earn a salary, live a real life (of the mind, of course, but also without taking loans to pay for food), and enjoy the full range of adult experiences. Don’t put your life on hold for some future utopia: that ain’t how this works anymore. Treat your PhD like a job: maybe it’s a low paying job, but that’s okay, because you really enjoy it. If you’re not going to enjoy this time, if you’re not going to be satisfied with your life while you do it, then don’t do it holding your nose for the glorious reward of the coming professorship. Because that’s a recipe for misery, all round. People change jobs a lot over their lifetimes. Consider the PhD as one more job: it’s a great job, so far as it goes, really. You get to follow your interests and your passions. You mostly set your own hours. Your colleagues are great fun, and really smart. You often get to travel. You’ll write a book-length study of your own devising. You’ll get opportunities to interact with the public through teaching. While in this job, you prepare for your next one, the next part of your career: sure, you’ll learn how to be a professor, but you should also hone your other professional skills, too, because you know the PhD doesn’t last forever. The sticking point in my plan is that you have to make enough money to live on. The real tragedy of grad school, often, is that students are so invested in the idea that are apprenticing into a well-paid professorial gig that they consider grad school an investment in future earnings–so it’s okay to take on debt, sometimes a lot of it, like law students or medical students do. That’s not okay, actually. Don’t go to grad school unless you can live on your stipend. It’s absolutely not worth taking on debt for. Debt will limit your options once the degree is done. Debt will embitter you. Debt will make you desperate. Let me be perfectly clear: if you consider the PhD a job (as I’m suggesting to) don’t go unless they pay you. Go if you think the PhD is a job you will enjoy for the amount of time you do it. Prepare for a number of different job scenarios that will arise when you finish. Maybe you will become a professor, but probably, you won’t: prepare for the next stage of your life, post-degree, accordingly. You don’t ‘waste’ your time in a job just because you ultimately change jobs. But we often think of the PhD as a waste if we don’t get a particular kind of next job, or if we’ve gone into catastrophic levels of debt to pursue it, or put off things in our lives (like having a family, or moving out of our parents’ homes) to get the degree. In those circumstances, a PhD might be a waste. Approach it like a low-paying, highly-rewarding, short-term job, though, and you can see more clearly to do a real cost-benefit analysis before you begin. Is that offensive? I don’t think this kind of pragmatism is incompatible with ideals: please, follow your passion! But the reward for that passion and its pursuit is going to be a dissertation well-written–I can pretty much assure you the reward is not going to be a tenure-track job. Don’t let that reality stop you from coming if you really want a PhD, and I would absolutely encourage you to come if you’re happy to live on your stipend for five years and then move on to something else. That, I think, is an ethical approach to graduate studies. Today is International Women’s Day. While we have much to celebrate–and indeed, have taken to celebrating here on this blog–it remains true that women do not enjoy the full complement of human rights in much of the world. Here at the University of Waterloo, a recent spate of incidents on campus and online demonstrate that even on the campus of a research university in Canada, women are still the targets of hate for some, and, perhaps, not taken fully seriously by others. This is a guest post by Shannon Dea, Assistant Professor of Philosophy, and Associate Chair of Undergraduate Studies in Philosophy, here at UW. For just under a month, women at University of Waterloo have been terrorized by an anonymous propagandist who claims that women’s “defective moral intelligence” poses a serious risk to the planet. Starting on February 7, when student election posters for female candidates were covered by misogynistic flyers, there have been three waves of flyers (two of them attached to eccentric and disturbing email messages) and two Facebook messages disseminated by an author who has variously referred to himself as Lord Irwin, nath007, Feridun Hamdullahpur (University of Waterloo’s president), and Sylvester J. Pussycat. The rustic and syntactically idiosyncratic communications, the most recent of which was emailed to assorted students, staff and faculty members late March 1, have bit by bit advanced the thesis that women should not be educated as highly as men, and that universities should not teach gender equity, because woman’s deceptively weak exterior hides her evil interior. When women are educated and treated as equals, according to the propagandist, they pose a real danger to the planet. The poster girl for this campaign is Marie Curie, who figures prominently in all of the flyers, and is characterized by their author as the “mother of the Nuclear bomb,” as the “evil” woman responsible for the deaths at Hiroshima and Nagasaki, and as the Eve leading a hapless Adam-Pierre Curie toward the apple of Nuclear weaponry. 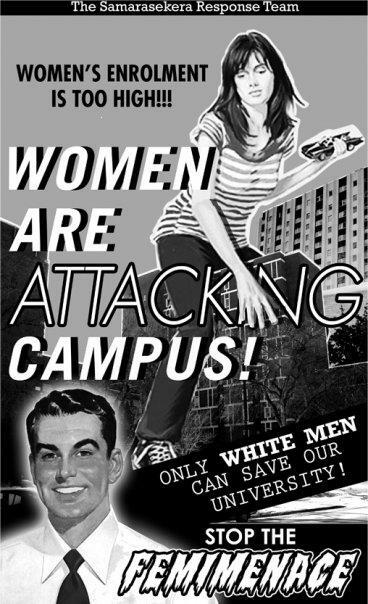 Understandably, women at UW are frightened. The day after the first Marie Curie email was sent out, the student government (the Federation of Students) closed the university’s volunteer-run Women’s Centre and LGBT student centre (GLOW), out of concern for volunteers’ safety. And, rightly so. Both centres are obvious targets. And, while the propagandist’s misogynistic ambitions may not extend beyond distributing his paranoid ramblings, no one’s willing to rule out the terrible possibility UW might join the ranks of Polytéchnique Montréal or Virginia Tech. Well, no one but the University, that is. Throughout this business, the administration has had remarkably little to say about UW women’s fears that the flyers may be warning signs of a misogynist who poses a real danger to them. At first, the University’s newsletter, the Daily Bulletin, didn’t discuss the flyers, with at least one staffer there dismissing them as a “prank”. Then, when the propagandist sent an email in which he impersonated Hamdullahpur, the Daily Bulletin reprinted an official letter from the president deploring the offensive message conveyed by the flyers and assuring readers that the president wasn’t really the email’s author. Of course, no one had ever taken seriously the idea that Hamdullahpur might really have sent the offending email. This wasn’t the message the university community needed to hear. We needed to hear that senior administrators and campus police were concerned about our safety and knew that the only way to secure it was to devote all of their resources to apprehending “Lord Irwin.” However, in the various official communications since this all began, the university has remained limp. In a discussion panel concerning the flyer campaign, audience members were disappointed to hear that the UW Police were pursuing the mystery man for charges of impersonation (of the president) and posting prohibited flyers. If they had any leads, they didn’t let on. Of course, I hope that the reason the UW Police are investigating misdemeanour charges against the perpetrator is that they know it’s important to catch him before he hurts someone and these misdemeanour charges are the best mechanism currently available to catch him. That is, I hope that the police are taking the incidents and the investigation more seriously than the charges they’re investigating would, in themselves, warrant. I hope that these charges are to the author of the posters as tax evasion charges were to Al Capone. While I hope all of these things to be true, no communication we’ve yet received from the University has warranted any confidence in these hopes. Instead, we get periodic reassurances that police are taking “appropriate action” and that all members of the UW community have the right to be safe and to feel safe. Well, sure we do, but what I need right now isn’t a university administrator telling me “I really want you to feel safe.” What I need is a crack team of computer scientists – this is University of Waterloo, after all! – quickly tracing the emails and Facebook messages back to their author before he hurts someone. Emblematic of administrators’ blindness to women’s fears was Associate Provost Bud Walker’s advice to audience members at the discussion panel that “You probably think everyone here is on our side, but there might be people walking through this room right now who don’t understand that women have a right to equitable treatment.” [Ok. Full disclosure: Walker has never in his life, so far as I know, uttered the sentence “Women have a right to equitable treatment.” But the foregoing is a plausible, if charitable, paraphrase of what he actually did say.] This shows just how wide the gap is between Walker’s experience and that of women at UW. No UW woman ever enters a public space on campus and assumes that everyone there agrees that she has a right to be there, and to be treated as an equal. As one after another audience member revealed in the Q & A following the panel, the climate for UW women is a chilly one at best, and sometimes it gets downright cold. This just in: women get more diplomas and degrees than men do, yet earn less. Clearly a job for the Samarasekera Response Team.